I have had a shopping addiction now for many years. It is only now that I have started to get help. It all started with a divorce with my parents, then my Father giving me an allowance, is where it started. I became dependant on him. Now I have built up more and more spending habits. He gave me about 30 dollars a week at the start (6 years ago)and I realized I was out of control when I couldn�t even survive on 3000 dollars a month, 1000 a week (right now). It became obsessive and I became ashamed, I would cut labels off clothes and hide receipts, cancel bank statements being sent to my house and I would constantly obsess over clothes shoes and accessories, and expensive jewelry. I would hide the fact that I bought 17 of the same tee shirt, all different colors and then I would buy clothes giving me a temporary high for a few days. I knew I had a problem when I started to find hundreds of shopping bags under my bed, in my wardrobe, with some dresses and skirts in them, many still the same way in their tissue paper, unworn with tags on. Seriously, I lived a lifestyle I could not afford to keep. My father still doesn�t mind, but I�m setting myself up for a big disappointment, when I am older and my boyfriend has helped me to control my obsession, for those who have this problem, there is a way to get out of it, support and love is a good start, and with the hand of God. Are compulsive returns the solution to compulsive buying? A sometimes unrecognized (or unacknowledged) form of overshopping is compulsive returning. Here, the overshopper regularly attempts to undo her habit by taking impulsive purchases back to the store for a refund. This, however, is an extension of the problem rather than a solution to it. The compulsive returner fails to understand that in shopping, as in physics, material things and energy are interrelated. Though she may somewhat mitigate the financial consequences of her compulsion, she does so at a very high price in time and energy. It's not unlike the high cost of credit card debt, where you end up paying double, triple, or worse for the items you've charged. 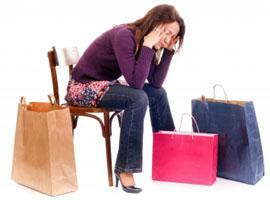 With compulsive returns, you end up spending two, three, or more times the energy and hours. And these resources are far more precious than your money-they're irreplaceable. Compulsive returners combine two seemingly contradictory tendencies: they're highly impulsive, yet they have a great deal of difficulty making up their minds. In addition, they're often in denial, completely out of touch with the huge expenditure of time and energy their habit costs them. If this sounds like you, your road to recovery may well begin with letting go of returns. Making it a personal policy not to return can compel you to face up to your overshopping--and help you prevent it, instead of squandering time and energy trying to undo it. And when you do shop, this policy will force you to be more decisive and will lead to better decisions. If you can't make up your mind--if you think you might wind up wanting to return the item--don't buy it! Leave it there! (You can always come back later if, upon reflection, you're really sure you want it.) Above all, don't kid yourself. Compulsive returning is overshopping. You're merely discharging your batteries instead of charging your credit card. As if this weren't enough, there's now another pressing reason to stop habitual returns. The practice costs stores money, and they've begun harnessing computer resources to put a stop to it. Though store policies still vary widely, many retailers now track both returns and returners. If you abuse the privilege, you'll find them saying firmly--and embarrassingly--"no" to your returns. Skip this awkward scene. Buy thoughtfully, and don't make returning your safety valve.